It's one of those precious delights of parenthood to share a book we loved as kids ourselves to our own children, and to relive that thrill of discovery through their eyes. But it's a completely different kind of pleasure, and one nearly as great, to discover a classic with your kids, one you somehow missed yourself in your own childhood. I mainly knew of Frank Tashlin as a famous animator (of Looney Tunes fame) and Hollywood screenwriter and director (of Jerry Lewis movies), and hadn't been aware that he'd dabbled in children's books. Then Dash's grandmother gave him a copy of the author's 1946 The Bear That Wasn't. It's a wonderful allegorical tale of a bear who is awakened from a long sleep by humans who are convinced he is not in fact a bear, but a very hairy man in a fur coat, and that therefore he should get to work on the large factory project that's sprung up around him as he slept. The bear calmly tries to tell the men otherwise, but is lectured over and over again, as he moves up to the highest levels of the corporate chain, that he must stop being silly and accept that he is not a bear. He heads to the zoo, aiming to get support from his fellow bears for his true identity, but even here he's out of luck: The zoo bears point out that if he were a real bear, he'd be behind bars like they are. Worn down, he figures that maybe they're all right after all and he's not a bear, and proceeds to live life as a human, working hard in a factory every day. 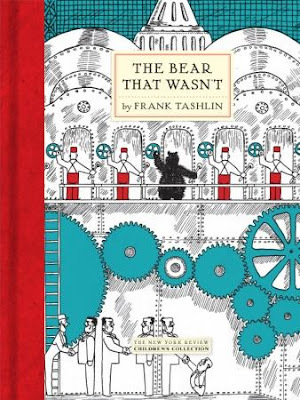 And it's not until circumstances lead him to solve the problem of a cold winter as a bear would that he concludes that he was right and all the bureaucrats were wrong after all, with Tashlin's sublime final sentence: "No indeed, he knew he wasn't a silly man, and he wasn't a silly Bear either." The message of individuality, of knowing who you are and not letting anyone tell you otherwise, is certainly loud and clear in this tale—as is the criticism of those who insist that anything repeated often enough must be true. But it's Tashlin's tone throughout that really makes the book a classic, mesmerizing to readers of all ages: The bear's quiet sense of puzzlement in the face of a series of humans who are arrogantly confident in their mistakenness is both sympathetic and very funny; you have the sense that the bear is never exactly convinced of his humanity himself, but just decides it's no use arguing anymore. (And there's a lesson there, too, of course.) The humans themselves are an amusing (though not harmless) parody of wrongheadness, becoming angrier and angrier when the bear stubbornly keeps insisting he's ursine. Dash adores this book (and I can only hope he takes its message to heart as he grows up); it's quickly become one of his enduring favorites. And I'm really glad to have discovered it myself, even at the advanced age of 42! It's been a summer of plenty for our family when it comes to kids' music: Nearly all our favorite artists have put out new albums, and every one seems to maintain or surpass the respective musicians' previously high standards. The band's fourth CD, Spicy Kid, gets its name from the gingerbread man of fairy-tale legend, whose point of view is the focus of the album's first track. As with most of these songs, though, there's more going on here than it seems: The album title (shared with that of the second track) serves as a metaphorical jumping-off point for an exploration of kids with attitude, as well. And all the songs are like this—the album is really directed as much at parents of young children (among which number Ledford counts herself) as at the children themselves. It's definitely the first kids' CD I've heard to get into issues like the feeling of sneaking along the hallway to check on your sleeping child without waking him up ("Awake"), or that moment when you realize the "spell the word out so your kid doesn't understand what you're talking about" ploy isn't gonna work anymore ("S.P.E.L.L."). All the while, Lunch Money upholds its well-deserved rep as one of the just-plain-best-sounding kid bands around. In fact, between the band's musicianship and Ledford's easy, laid-back vocal style (which has already established her in my mind, at least, as one of the signature voices of today's kindie music), you might take this album to be a strong college-radio outing (with '90s influences like the Lemonheads, R.E.M., and even the softer side of Dinosaur Jr.) if you weren't listening to the lyrics too closely. 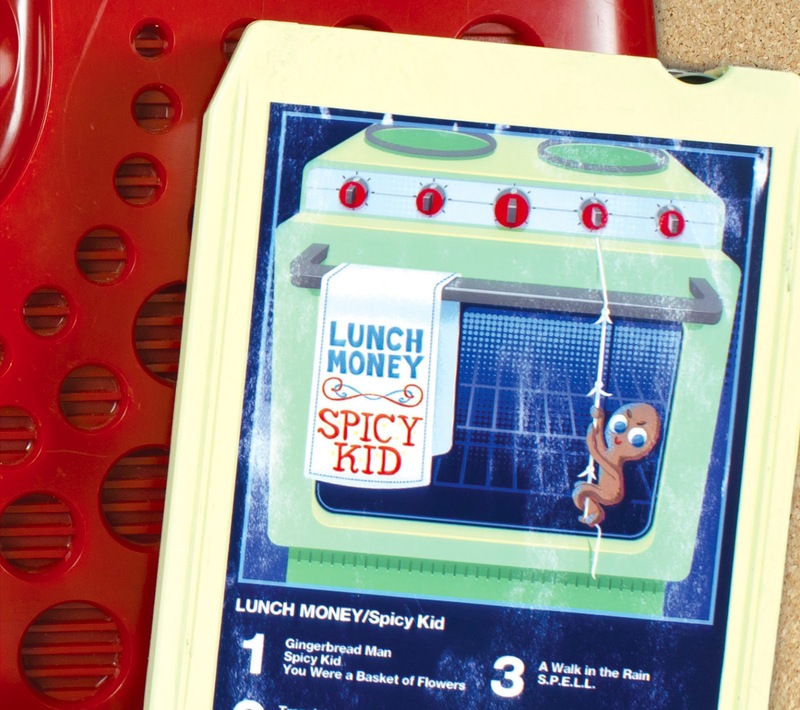 All of which is to say: For such an approachable, listener-friendly album, Spicy Kid is pretty darn sophisticated. And I know I always say this with these bands, but we already can't wait to hear what Lunch Money does next. 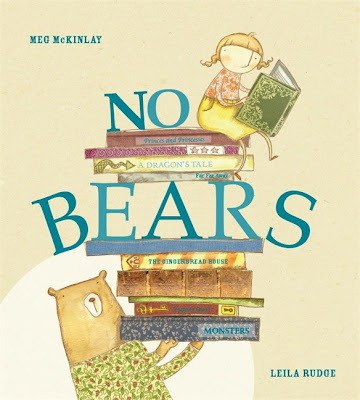 The most recent example is a new favorite of our three-year-old's, No Bears, written by Meg McKinlay and illustrated by Leila Rudge, in which a girl named Ella—one of those matter-of-fact, feisty girls Australia is apparently full of, given how perfectly the nation's authors capture the type—tells us about the book she's writing. 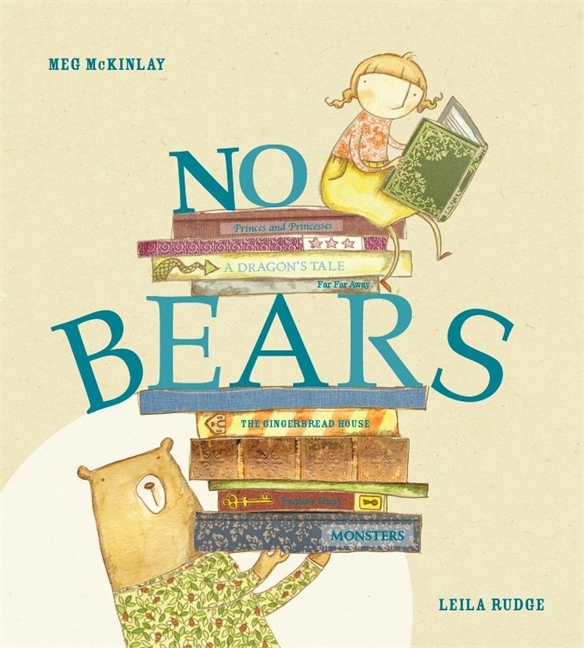 It's an adventure story about a princess, but this narrator wants to make things clear from the start: There will be no bears in this tale, because "I'm tired of bears. Every time you read a book, it's just BEARS BEARS BEARS—horrible furry bears slurping honey in awful little caves. You don't need BEARS for a book." And she goes on to prove the point: Her princess is kidnapped by a terrible monster, then rescued by a fairy godmother, without a bear to be seen. 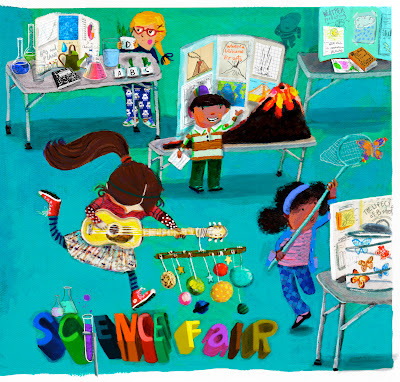 Well, except for that one outside the "frame" of the illustrations, who seems to be helping Ella create both the story and the art. And who also seems to step into the story herself momentarily to save the day when that fairy godmother has misplaced her wand. And who can be seen at the end telling all Ella's characters what really happened. But other than that, nope, no bears here at all. No Bears is sweet, it's funny, it's clever, and it's visually imaginative. In other words, it's everything I've come to expect from a picture book from Australians! Well, I had intended, in advance of our family's recent vacation in western Ontario (where, I was warned by my in-laws, Internet service might be spotty at best), to bank a number of posts to be automatically posted while I was gone. But amid the frenetic planning that always precedes family vacations, those intentions fell by the wayside, and the result has been a long gap between posts, even by my fairly laid-back standards. So I'm going to be posting a little more frequently than usual for what remains of July, to try to make up for that (as well as to get my total posts for the month in the column on the right to a slightly less embarrassing number). I'll plunge into the new stuff—of which there's plenty to catch up on—a little later this week, but today I'd like to simply express my gratitude to a video game. All of which, with a seven-year-old and a three-year-old in tow, could have been a complete nightmare—but for my iPad and the LEGO Harry Potter game I'd loaded onto it a while back, for just such occasions. It kept our older son mesmerized for most of those hours, and our younger one (mostly just watching!) for a decent number of them as well. It was still not exactly a fun day, of course, for any of us, but it could have—and not that long ago would have—been far worse. 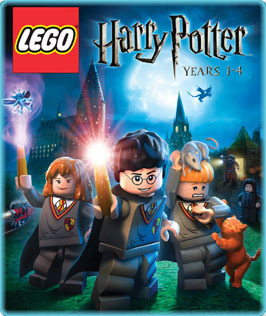 And for that, makers of Lego Harry Potter (ooh, I see the second game in the series has come to iOS now as well! ), we cannot thank you enough. I guess the first big wave of all-star music compilation albums for charity came in the 1980s, coming off the high-profile all-star singles of Band Aid and USA for Africa (though really George Harrison's Bangladesh concert in the mid-'70s probably inaugurated the general concept). Following the premise that whatever was big during the childhoods of those of us who are now parents will become big anew in children's entertainment, it's not shocking that we've started to see some great all-star kid-music compilations of late. The great thing these—besides the no-longer-even-remarkable fact that the genre indisputably has more than enough leading lights to fill several such CDs—is that the best ones give kids and parents a chance to sample the genre, and perhaps even find some new favorite artists. Many of our family's favorite artists are here with typically top-notch contributions—the aforementioned Lunch Money and Mitchell, as well as Frances England, Barbara Brousal (whose name may be unfamiliar, but whose gorgeous voice is unforgettable to any parent who wore out Dan Zanes's first several albums), and Secret Agent 23 Skidoo (here backing up MC Fireworks, aka his daughter, on the ebullient "Rocket Science"). A couple of bands known for their non-kid music make an appearance as well: '90s Brooklyn rock band Babe the Blue Ox with the dissonant, new-wave-y "Surfin' Minnesota" (which our three-year-old has dubbed his top pick on the album); and Mates of State with a fitting cover of Guided by Voices' "I Am a Scientist" (the video for which is below!). It all adds up to another top compilation from Spare the Rock that makes contributing to a good cause a doubly pleasurable experience.